The state’s bill for moving dead bodies has doubled in the last few years. Business is booming for one somber industry in West Virginia: the transportation of dead bodies. The state’s Department of Health and Human Resources paid private contractors $881,620 in fiscal year 2017 to shuttle corpses from one place to another ― more than double the expense two years before. The number of body transports went from about 2,200 in fiscal year 2015 to some 4,200 in fiscal year 2017 (which ended June 30). Public health officials and funeral directors alike blame West Virginia’s soaring number of fatal drug overdoses for those sharp increases. Jim Lowry, who’s been in the funeral business for 62 years, came out of retirement three years ago to help Charleston Mortuary Services handle the increase in bodies that must be shipped to the state morgues. Needle marks on arms and hands and body bag tags that read “Pending Tox” identify those who likely died of a drug overdose. They are mostly younger adults, ages 18 to 30. More than 880 people died of drug overdoses in West Virginia last year ― a record number. The state has the worst drug overdose death rate in the nation. Every fatal overdose requires at least two trips ― from the place of death to a state morgue and then from the morgue to a funeral home. Each corpse must be autopsied, and a toxicology report must attempt to pinpoint the drugs that caused the death. Some overdoses involve even more trips ― to a hospital, for instance, where a county medical examiner conducts a preliminary exam before referring the body to the Office of the Chief Medical Examiner for autopsy. “If there are 20 needle marks, you get some idea of what’s going on after the initial examination,” said Dr. Rahul Gupta, the state’s public health commissioner. Jim Lowry came out of retirement three years ago to help Charleston Mortuary Services handle the increase in bodies needing transport. Following autopsy, the dead are loaded into vans and returned to funeral homes or mortuaries, many to be embalmed. In the case of someone who died of a heroin overdose, “we use a little bit of a stronger solution than, say, on somebody that dies of a heart attack,” Lowry said. The opioid crisis has been building in West Virginia for more than a decade. Over those years, no company has profited more from body transports there than Tri-State Mortuary Services, based in Poca. Since 2003, the state has paid the company $3.2 million for that service, records show. A 2015 legislative audit found that Chad Harding, owner of Tri-State, and Mike Scragg, then operations chief at the medical examiner’s office, had signed a handwritten contract that was meant to steer all body transport business statewide to Tri-State from 2008 to 2018. Auditors concluded it was invalid. But Tri-State had already become the go-to contractor. In 2012, the company received 94 percent of the state’s transport business to the state morgue. 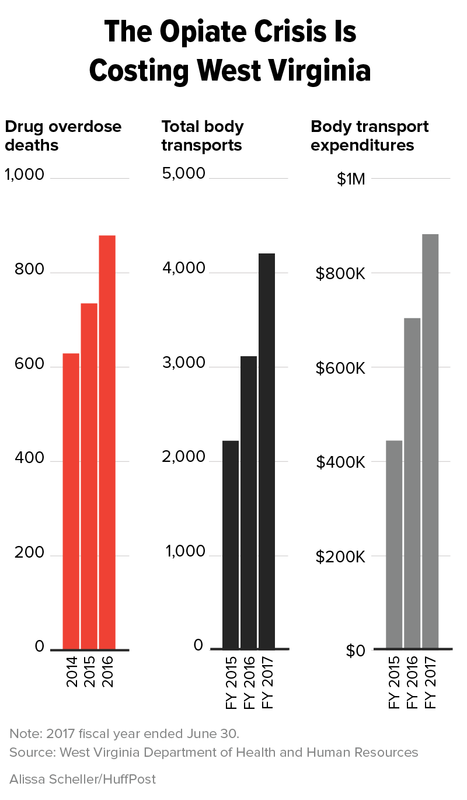 Payments to Tri-State even increased in years when overall spending for body transports dropped. “The reason they had so much business was that they had an insider throwing business their way,” said Rob Kimes, executive director of the state Funeral Directors Association. What’s more, auditors reported, a state Bureau of Public Health employee was typing up the invoices that Tri-State submitted for payment. No other contractor received a helping hand. The audit also found that Tri-State was billing West Virginia for “wait time at the scene” ― a prohibited expense. The extra fee was handwritten on each invoice. State policy allows contractors to charge only for mileage and only when a body is on board the vehicle. A follow-up report issued earlier this year criticized body transport contractors for “miscalculations” and “billing errors” that drove the state to spend at least $141,000 more than it should have between 2010 and 2014. Charleston Mortuary Services ships the bodies of those who died from apparent drug overdoses to the morgue for autopsy and then on to a funeral home. Last month, the state banned Tri-State from picking up and delivering bodies to the chief medical examiner’s office, citing the company for a potential “breach of confidentiality.” In a letter, the medical examiner’s chief administrator wrote that Tri-State was in possession of confidential documents that appear to have been taken from the state morgue’s personnel and decedent case files. Tri-State is affiliated with Gatens-Harding Funeral Home, which has itself faced years of state scrutiny. In 2015, West Virginia Attorney General Patrick Morrisey brought a complaint against the funeral home, alleging that it violated state law by cashing in on pre-need funeral contracts before customers’ deaths. Harding recently settled the case, after Gatens-Harding agreed to audits and a $25,000 fine. Since Tri-State’s suspension in August, there has been no shortage of body transport contractors willing to step in and do the job. On Sept. 8, Gatens-Harding notified the state that it planned to sue Morrisey’s office and the medical examiner’s office over the decision to suspend Tri-State’s license to transport bodies. The funeral home’s lawyer, Ramonda Lyons, wrote that the suspension was “arbitrary and capricious.” Lyons declined to comment last week. Lowry, 74, started working at a funeral home when he was 12 years old. By age 18, he was embalming bodies. In 1972, he was the first embalmer at the Buffalo Creek flood, a disaster that killed 125 people when a coal slurry impoundment dam burst in Logan County. He embalmed 65 bodies that week. He figures he’s embalmed 67,000 bodies over his career. More than 880 people died of drug overdoses in West Virginia last year. The state has the worst overdose death rate in the nation. But now the epidemic of drug overdoses has increased the number of younger West Virginians whose bodies must be picked up and delivered. And that is taking a toll, he said. The body transport business is not difficult to break into in West Virginia. There are few regulations. “All you need is $2 million of liability insurance, a van, a cot and a driver,” said Kimes of the Funeral Directors Association. With Tri-State out of the picture, the medical examiner’s office now selects contractors on a rotating basis. They have to be willing to pick up bodies day and night. West Virginia has two state-operated morgues ― in Charleston and Morgantown ― where medical examiners conduct autopsies. The Morgantown office, with just one medical examiner, can handle only 250 autopsies a year. It typically takes two weeks to autopsy a body after a fatal overdose, a delay that upsets some grieving families who must put off funeral services. The transport companies, meanwhile, are often driving long distances to pick up bodies, which also hikes the costs. Berkeley County in West Virginia’s Eastern Panhandle has the second highest overdose death rate in the state. The county saw 94 overdose deaths last year. It’s also a four-and-a-half-hour drive from Charleston or a two-and-a-half-hour trip from Morgantown. On the state’s western border, Cabell County has one of the highest overdose death rates in the U.S. It saw 132 fatal overdoses last year. The county is about an hour from Charleston. “We go anywhere the M.E. has us go,” said Lowry, whose Charleston mortuary has three drivers and five vans, each retrofitted to make space for two cots. Charleston Mortuary Services has five vans retrofitted to carry two bodies at a time. 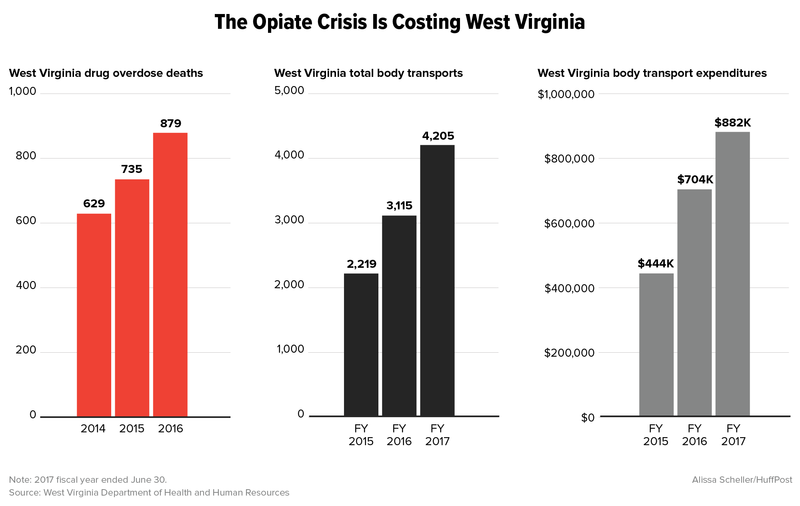 Since 2003, West Virginia has paid $7.7 million to companies that transport the bodies that require investigation ― people who apparently died from overdoses, car wrecks, shootings and other causes. During the legislative session earlier this year, state lawmakers approved $500,000 in supplemental funding to pay those rising costs. To reduce the burden on taxpayers, the state forbids transporters from charging for two trips if two bodies are hauled to the morgue in one van. The state reimburses for 1.5 trips in such cases. By law, however, the state picks up the expense for shuttling bodies to the medical examiner’s office and returning them to funeral homes chosen by their loved ones. Families aren’t left on the hook for transport costs. Reach Eric Eyre at ericeyre@wvgazettemail.com or 304-348-4869, or follow @ericeyre on Twitter. Top photo by Kenny Kemp/Charleston Gazette-Mail.